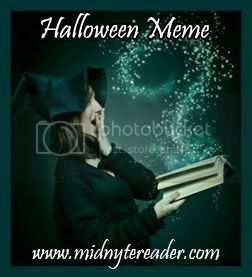 Midnyte Reader: Halloween Meme #5 (10/31/14). Welcome to my Halloween Meme! Each Friday in October I will be asking a Halloween or Horror related question. Feel free to simply answer the question in the comments below OR grab the button to create a post on your blog and don't forget to come back and leave your name/url in the linky. Check out other blogs for their posts as well. Question: Do you have a book that you read every year to get in the mood for Halloween? If not, do you have a tradition that you participate in? Answer: I haven't re-read a book in a very long time, but I do try to read scary books often and I double my efforts come Fall. I also watch scary movies and at Halloween time there are so many on to choose from. I also make sure to go to a haunted house as soon as one opens for the season. I'm not all that into scary but I do make an effort to read creepy books this time of year. And I watch Hocus Pocus at least once every October. Distinguished way of writing, I very carefully read the entire one. Look forward to more! Authentic submit today! You generate up good written material on a particular topic. Superb!